I'm not good about making a big breakfast in the mornings. In fact, I find pouring some hot water on instant oatmeal to be about the extent of my morning cooking capabilities. Our family does love traditional hot breakfast foods, though, so we often have "breakfast for dinner." It's quick, easy, and inexpensive, perfect for times like last night. Fritz had to hop off to teach cub scouts after work, then head right out to a church basketball game. 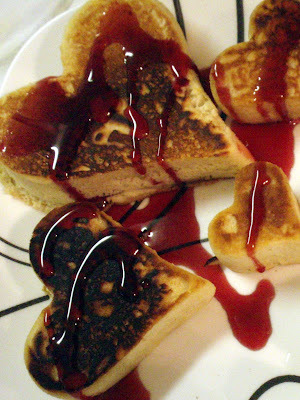 To make the dinner a little more fun, I poured the pancake batter into metal heart-shaped cookie cutters. I was worried they wouldn't cook through, since they were so thick, but it didn't turn out to be an issue. If you try this, make sure to spray the inside of your cookie cutters with nonstick cooking spray first. You might also want to avoid using a coated nonstick pan if your cookie cutters have sharp edges. Breakfast for dinner!!! 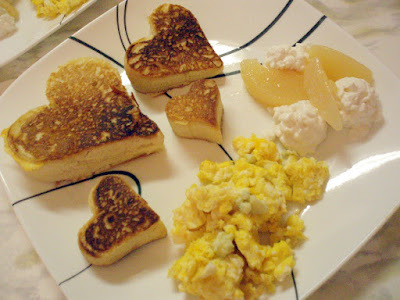 We're huge fans, but I've never thought of using a cookie cutter to jazz up my pancakes. You've inspired me. 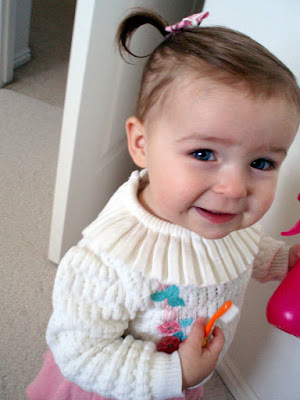 Also, Margaret is completely gorgeous. 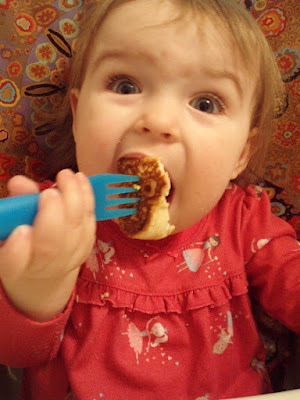 So do you think Margaret likes pancakes? It's kind of hard to tell from the picture. You're making me want pancakes.